A common complaint about the system. The Switch generally last between 2 and a half to 3 hours depending on the game you are playing. In comparison the 3DS has a battery life of 4 to 6 hours. Alright, I need to clarify that this ‘hidden costs’ point is a case by case scenario. For an example, I myself didn’t purchase the Pro Controller (I find the Joy-Cons with the attachment works well enough) but I did buy a 64GB SD Card since game cartridges are hard to find (from where I’m from) and quite a number of games are digital only. Not to mention essential accessories like hard case, screen protector and cartridge holders. I personally find that the hard case is a must have for the Switch. Comparing that with a Playstation 4 or Xbox One, you don’t really need to purchase additional stuff to get it up and running, except for games of course …. or PSN Plus / Xbox Live …. or a TV … or a table to hold the TV … okay … think I’m getting off track here. Oh and you might want to purchase a powerbank if you plan on using the Switch outdoors. That’s another hidden cost. At the time of this post, there’s absolutely no way to backup our game saves. While I’m sure Nintendo will eventually come out with a solution to fix this issue in the future, it’s quite baffling that we can’t even perform a simple copy-to-pc kind of backup. This is just a minor complaint but I wished Nintendo made a sturdier kickstand. While it is not as bad as how CNET made it out to be, the Switch does feel like it’s going to tip over when you try to operate the power or volume buttons with one hand. As a hybrid gaming console, you will probably find yourself playing the Nintendo Switch outside your home once in a while. Unlike the 3DS which sports a clam-shell design that gives it some form of protection, the Switch is pretty much ‘bare’. It doesn’t help that the Switch’s screen is using plastic material instead of glass, making it prone to scratches. As a Switch owner myself, I definitely recommend getting a hard case if you plan to bring the device outdoors. NOTE: This post contains affiliate links which means I earn a small commission at no extra cost to you if you purchase through that link. This helps to keep my blog going. Thanks for your support! 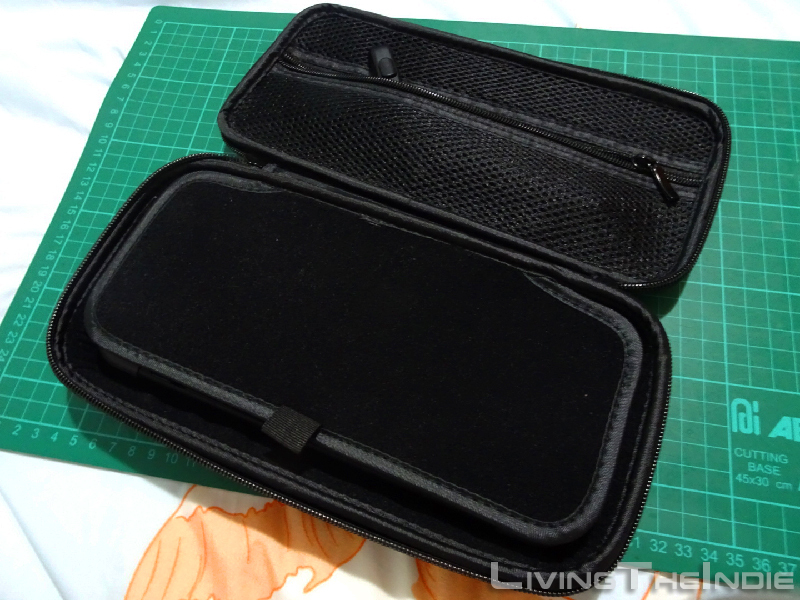 A hard case provides better protection overall compared to sleeve ones. 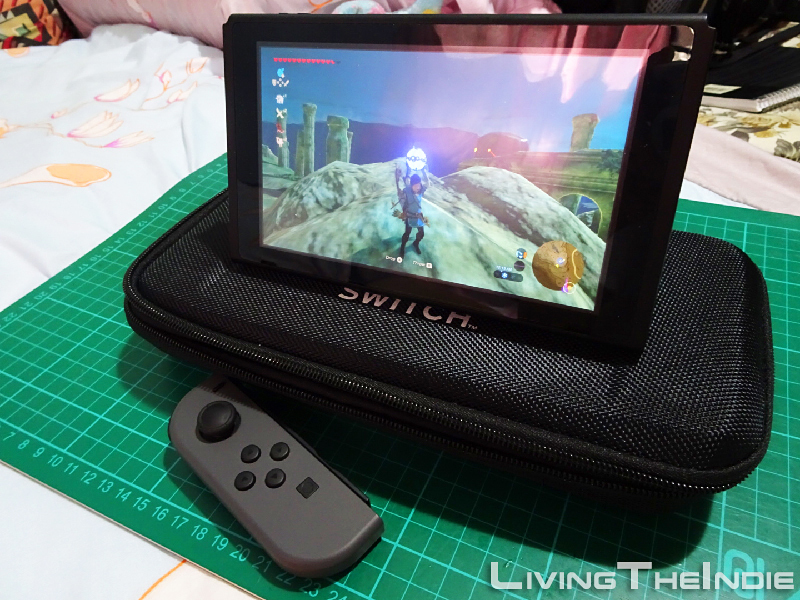 Sure, you sacrifice some slimness but knowing that your Switch will not likely to be crushed (when placed inside a luggage with other things) or damage during an accidental drop, I think it’s worth it. Most hard cases comes with extra storage space, allowing you to store things like game cartridges, Joy-Con’s wrist strap or ear phones. Playing the Switch in tabletop mode can cause some strain on one’s neck since you need to look down at a certain angle. With a hard case, you can prop the Switch on it for extra height. It also protects the back of the Switch if you happen to accidentally knocked it over. 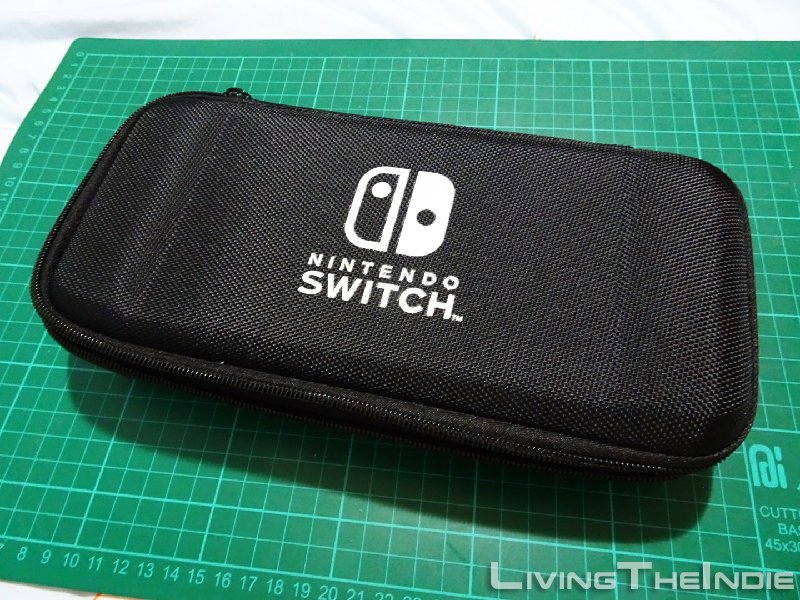 If you are looking to buy a hard case, I recommend that you get the official Nintendo Switch Carrying Case and Screen Protector bundle [Play-Asia], a product by Nintendo themselves. The one I’m currently using is by Keys Factory. Unfortunately it’s currently out of stock on Play-Asia and nowhere to be found on Amazon.